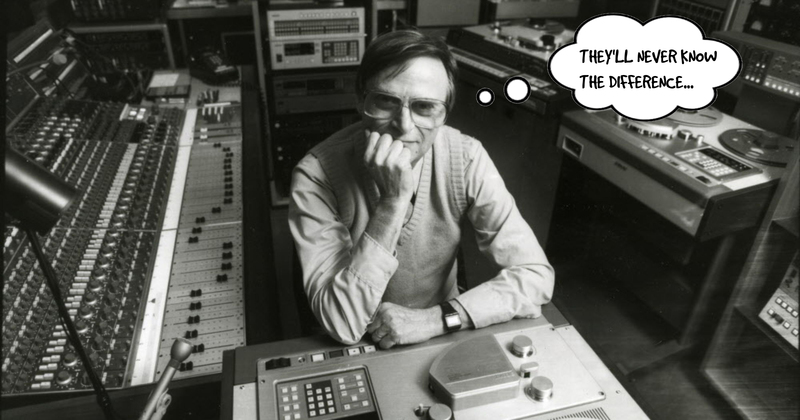 Van Gelder fakes fake stereo: it’s all good! Selection chosen for the scarce recording presence of Elmo Hope, and the young Byrd and McLean strutting their stuff backwards and forwards running the changes double quick time in a delightfully simple mainstream bop piece. Early Prestige recordings are often labelled mere “jam sessions”, but jam goes with bread and butter, and scones, don’t knock it. The selection is also intended for a less worthy purpose: to enable you to check out what “electronically re-recorded for Stereo” sometimes actually means. 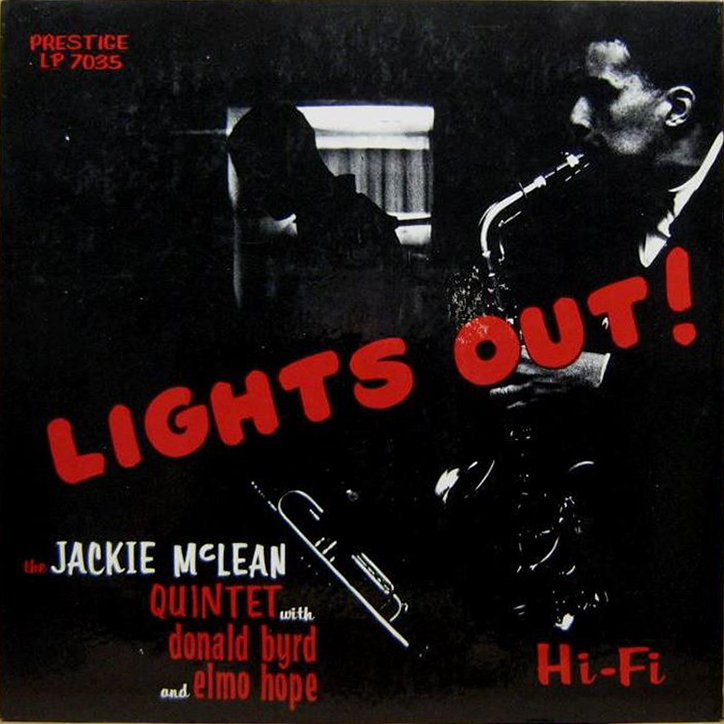 Recorded January 1956, (almost 1955 if you wish) only McLean’s second title as leader, “The Jackie McLean Quintet”, with Elmo Hope in place of Mal Waldron on the first outing. Bop with no signs of dark clouds outside gathering on the horizon, happy swinging foot-tapping cheerful music in what I imagine was possibly still a hard time for many. The LJC Rule of Opposites: poor people dress up, wealthy people dress down; in times of hardship people want happy music to cheer them up, when all their needs are met, they prefer to wallow in existential angst. Not everything is as it seems, sometimes it’s the opposite that provides the insight. Story was apparently they turned the Hackensack studio lights down during recording, to foster a club ambience. I rarely listen in the dark myself, for fear of spilling my drink on the sofa. It’s not the sofa I worry about, it’s the waste of a good glass of Cotes du Rhone. The original recording must have been single track mono – our mutual friend will know – and by 1970, Stereo was de rigueur the essential commercial format. 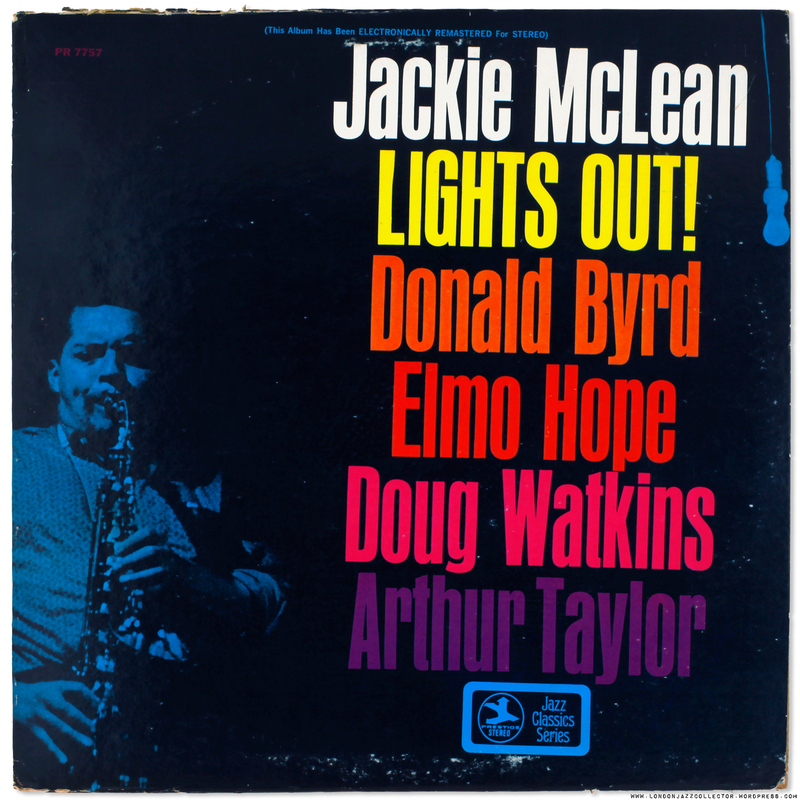 Weinstock: Rudy, were going to reissue Jackie’s Lights Out! Weinstock: Money Rudy, Money. This time, make it Stereo. I’ve no idea how you do it, just do it. Ye of little faith. Do you really think Van Gelder would butcher one of his own recordings, just because Weinstock demanded Stereo? With many Blue Label/ Silver Trident Prestige reissues, the original RVG stereo or mono master metal was wheeled out, the original matrix code (catalogue number) scratched out, and the new catalogue number scratched in, and then repressed. Effectively, the blue label reissue and the original have the same parent. However this time here is an early mono recording and no previous stereo master to renumber. Weinstock wanted a stereo product, and Rudy was going to have to create one from scratch. So, Van Gelder took the mono recording, and re-mastered it “electronically”, (how else, wood-burning stove? Scully Aga?) He cut the same signal on the left and right channels, no filtering, no differential instrument separation, no jiggery-pokery, “stereo” in name only, delivering two matched mono images. That’s still a stereo record isn’t it? 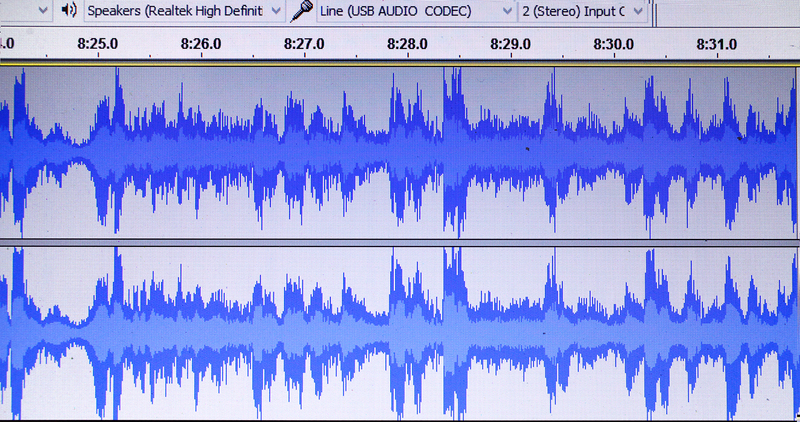 Here are the two channels as seen in Audacity during the rip of Kerplunk, everything played and ripped in stereo. There are very tiny differences between left and right channel waveforms, which maybe due to slight asymmetry in channel amplification/ processing, one valve is not quite perfectly matched with another, who knows, but they are basically the same histogram all the way through. It is mono stereo. A new acetate was cut, now with VAN GELDER stamped in the run-out, Prestige Stereo Edition, and voila, fake fake stereo. Bless you Rudy. An interesting extra twist for the observant dead-wax watchers: etching LW – Long Wear Plating Company, as found on all Impulse masters. Come 1970, Prestige needed metal parts, Rudy would know of Long Wear as a previous customer. Here is the original, dramatic black and red cover that sends collector pulses racing, and their bank manager hyperventilating. Popsike tells the story, a lot of money for the original Prestige RVG mono, but ahh, that cover. There are alternatives in mono. If you get the urge to hear the Gershwin track A Foggy Day (in London Town) actually in London town, the 1957 British Esquire might fit the bill, complete with naff alternative cover: it’s got a cartoon light bulb, it is on, and out, in case you missed it. They were never profound with alternative covers at Esquire, not even graphically strong. Weinstock clearly saw the opportunity to cash in on McLean’s rising star, and brought New Jazz repress into service (1961), most likely reusing Rudy’s original master, but with the hazard of recycled vinyl added to the mix, something which dogs a good few New Jazz issues. The cover photo is great, the light bulb positioned out of kilter, off-balance, creating dynamic tension between light and Jackie. The 70s cover reuses the same photo but mucks up the dynamics by inserting the cast list in huge letters, destroying the way the picture works. Bloody Philistines. Finally we have today’s post, Prestige 7757, cheapest of the heap, with “stereo” ingeniously not “faked”, depending on what you mean by fake. The minute I picked up the vinyl and, instead of original hand-etched RVG, or nothing, I saw the VAN GELDER stamp in the dead-wax. I put my faith in Rudy, he would do the right thing. 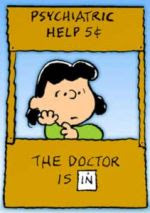 If you are up there following this, Rudy, I hope it’s put on an extra smile on your face! Anyone has any other sort of encounters with “fake stereo”, please tell your story, expand the knowledge. 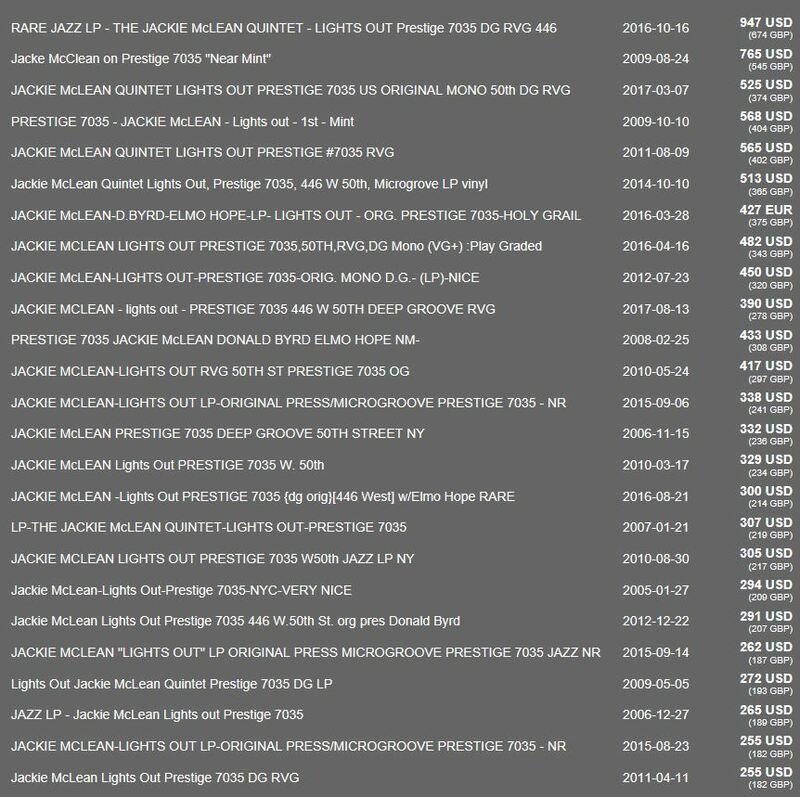 This entry was posted in Jackie McLean, Prestige and tagged Fake Stereo, Prestige, Stereo, Van Gelder by LondonJazzCollector. Bookmark the permalink. There is a Prestige twofer from the 70s that claims to be stereo but is actually mono cut with RVG stamps. It is Miles Davis self titled (Prestige 24001) and includes Cookin’ and Relaxin’ both with RVG stamps. There are others in this series cut with RVG stamps (although they do not claim to be stereo), Coltrane More Lasting than Bronze (Prestige 24014) includes Lush Life and Coltrane, Miles Davis Collector’s Items (Prestige 24022) is another one. All of these exist both in an early version with RVG stamps and a later remastered release. There are many many different versions of each label (different fonts, word placement, etc) so its not easy to tell what version you’re going to get unless you can read the runout. Specifically it’s “Van Gelder” stamped on these, not “RVG”. Jackie was such a smoking bop player. Absolutely love the joy that comes out of that man’s horn. And the Bird influence is hard to miss on his ’50s stuff. Makes his ’60s transformation all the more unexpected and impressive! I have always been surprised how well these fake stereo reissues sounded. The only thing that bothered me was the print “remastered for stereo”, very disturbing indeed. When I started collecting in the 90’s I quickly found that “Electronically Remastered For Stereo” was almost always a bad choice especially once I started listening with headphones. “Re-channeled For Stereo”, meant it was either a 2 track tape meant for mono just separated without effect into corresponding left or right channels or the mono master was used for both channels. Prestige Blue Label pressings of earlier titles weren’t considered collectable therefore very inexpensive to take a chance on. I was able to a/b some original mono pressings vs the “Electronically Remastered For Stereo” version and they were obviously mastered directly from the same original mother plate(sic). Overall I found Prestige fairly disingenuous in both the way they treated musicians and their customers. Glad I picked up this LP. First off, having a platter with Elmo Hope on it is invaluable. 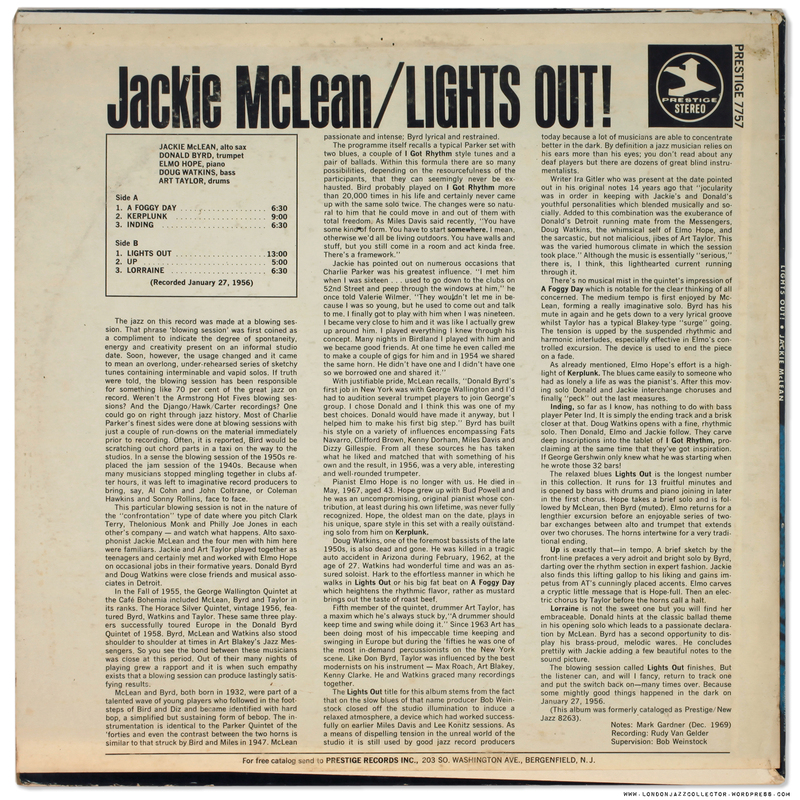 Second, early Jackie McLean sessions are my favorites of his music. Regardless of the pressing, it’s one I’ll always be proud to own. Kudos to RVG not to put out a fake stereo – for this is as mono as it gets! I have had the suspicion that Prestige, for commercial reasons, just printed ‘stereo’ on the cover, leaving the original mono sound just what it was, unaltered. In the case of the early sixties re issue in ‘stereo’ of the first M.D. Quintet (7014), I noticed a cleaner sound, a better HI FI, but no stereo, echos or whatsoever, just a very clean mono sound. When I sold the stereo re issue to keep just a green NYC and blue N.J. copy each of 7014, I had some regrets, the stereo re issue having a better sound than the originals. Rudolf – Interesting but not surprising. A more recent mastering can indeed sound better that earlier….but it depends on the title etc. I myself have a problem when they rechannel or try to do som magic with a pure mono recording. I do not even like to add stereo reverb to mono signals. It has been done quite often in the classical domain. Some of you might have caught the other anomaly, my labeled side A has the the side B matrix in the deadwax yet plays the correct side A songs and vice versa. It also has the Abbey pressing ring, commonly found on the B side on this A side (they probably saw the B in the matrix and loaded the plates in the stamper normal fashion). Confused yet? I can provide pictures tomorrow of this would help. Sorry, I inverted side A & B in the first sentence (looking at the deadwax, not label). Andrew please fix if you are so kind! Rudy also pulled this fake/fake stereo move on the 2nd cover version of Soultrane. “Electronically Remastered For Stereo” on the top of the cover, but Van Gelder in the deadwax and no obvious sonic trickery. Someone suggested that the minute left/right differences detected resulted from him playing back the original mono tape on a stereo deck and using a stereo cutter head. I have to doubt Van Gelder would ever play a mono tape on a stereo deck, that IMO is as huge an engineering fail and dis to the original recording as fake stereo, which Van Gelder did himself of course. I have to imagine differences in the two channels are attributed to pressing imperfections including noise. Just to play Devil’s Advocate, what if by the time he was cutting these “Electronically Remastered For Stereo” versions in ’68 he retired the dedicated mono lathe as it was no longer relevant for the vast majority of records he was cutting? Even if he took the mono cutter head out of service in the ’70s, I mean he was still a mastering engineer, and it seems that most mastering engineers (who specialize in vintage recordings) have a full-track tape machine, even to this day. I also can’t imagine him doing the RVG Edition CDs with a stereo tape machine for the mono LPs. Cutting mono with a stereo head on the other hand, I see that as more likely, if you are simply doubling the mono signal I would think that the minuscule differences in the groove walls would be inaudible, and I say this because I have several mono reissues cut with the narrow groove spec and they all sound straight down the middle mono. Also, I’ve seen critics (Art Dudley) write about theoretical differences between cutting mono with a mono and stereo cutter head. While I don’t think that lies outside of the realm of possibility, I don’t see that creating any noticeable differences in the cut either. I recently looked at numerous mono reissues under a mastering engineer’s microscope and the groove walls all looked just as uniform as the walls on mono discs cut before the dawn of stereo. Additionally, volume differences/fluctuations wouldn’t appear as differences in the shapes of the waveforms, they would just possibly cause brief, minuscule variations in the amplitude (volume) of the channels. On the other hand, noise particular to each wall would, but that would have nothing to do with the mastering. Just like Soultrane, there is a veeeery slight left/right spread audible when listening through headphones and toggling the “mono” switch, which is not present not the earlier cuts. Who, knows though? It does seem plausible to me since each of the twin tracks on a RtR deck have independent bias/EQ adjustments which would account for this slight left/right spread if a mono tape was played on it. I don’t have any evidence to what Rudy actually did and by the time I started working in recording studio over 25 years ago, mono was a non-issue and analog was sadly was walking out the door. Of course, I have no evidence either. 🙂 I’ve never played a mono tape with a stereo machine but Steve Hoffman has always been vocal about the side effects of this, the main one being a “wispy/washy” reproduction of the high frequencies, but it should only happen when you sum to mono, which would be caused by phase anomalies between the left and right channels. Also, a slight “spread” on a mono LP can be caused by groove wear setting in differently on the groove walls…very common in my experience (extremely common with old mono 45s), and wondering if you’ve heard this with more than one 70s copy of Soultrane. Perhaps your original just doesn’t have as much wear? That’s a good point about bias and EQ though, there could be mild variations between the two channels related to that…though again, I’d think a professional like Van Gelder would have a stereo machine calibrated pretty evenly. First time I’ve seen this trick Van Gelder pulled on the label! And yes, the original album art is very bold and captivating. Fascinating, and well-written as usual. I have this same pressing. I love it. Now I need to pull it off the shelf again. Great sample cut as always – thank you sir! I remember the Mobley’s Second Message fake stereo re-issue from this period having a mono presentation as well. Dear LJC – thank you for shining a light on the subject of “electronically remastered for stereo” which does sound slightly better than“electronically re-recorded to simulate Stereo”. Now that we have seen an example of the VAN GELDER stamp on a Prestige record I wonder if anyone can site an example of the VAN GELDER stamp on a Blue Note under the same circumstances? Thank you for your usual brilliant presentation on the subject! Note that this is not your typical “electronically remastered for stereo”. This is a case where Van Gelder assumed the label wouldn’t be able to tell the difference between true mono and “electronically remastered for stereo”. This is true mono.